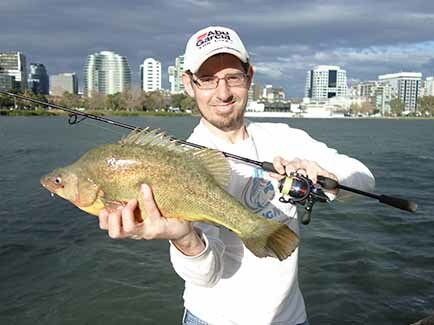 Alan Bonnici went fishing around urban Albert Park Lake which is only a measly 3klm from the CBD. Fishing with a range of hard body lures and soft plastics Alan managed a stunning 48cm Golden Perch and several small stocked rainbow trout. Was great fishing considering the hurricane winds which made casting close to impossible. Its amazing the quality fishing that can be had so close to the city of Melbourne. A big thanks to Nick Keeling.